I've been a Jamie Oliver fan for years but I've only just heard about his Food Revolution project, which has me amazed...shocked...and inspired. We've always eaten pretty healthy growing up...my mom home cans a lot of fruits and sauces, she loves to make homemade bread and everything from scratch. But as I've gotten older and am not always able to eat what mom cooks, it's so much easier to buy a boxed pizza than whip up a meal from scratch. In the last year I have gotten much better and started to enjoy cooking with fresh food, because to tell you the truth, it tastes way better. But watching this show, I find myself wanting to never ever put processed food into my mouth again no matter how lazy or hungry I am. I don't think we take good food seriously enough. 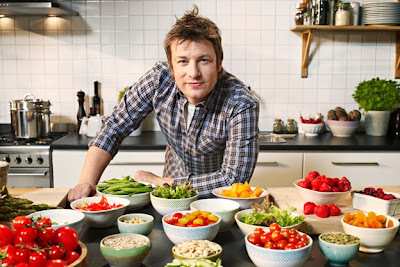 I'm seriously hooked on this show and I find myself feeling so grateful for what Jamie Oliver has started in America. I really like this show too. I found a few episodes of it a couple of months ago, but now I want to go find the rest.